There is no other animal, besides dogs, that have served humans moreso than them. 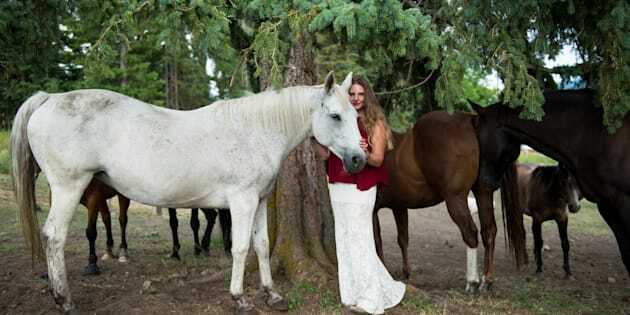 Hillary Schneider Leadership Coach, Equine Guided Facilitator, Founder of Epona Rise Retreat Center. Recently CTV News published a piece on horses being sent to slaughter and shipped to Japan for meat. The story spoke about how they make sure the horses are treated and handled ethically on their way to slaughter, as if to make it seem "OK."
The fact that horses and slaughter are together in one sentence is tragic. That any animal and the word slaughter go together is horrific, and yet there is a way that I think horses are different. We have domesticated horses from the wild; there is no other animal, besides dogs, that have served humans moreso than horses. We have taken them to war. In fact, the wildly popular film War Horsedepicts a horse and his journey to war, giving us a glimpse of the sacrifice these incredible animals made for us and continue to make when we are fighting our battles. Moving from war to supporting veterans with post-traumatic stress disorder, there is extensive research on how effective equine therapy can be to those who suffer from the after-effects of war and are adjusting to everyday life post-trauma. From treating autism and physical disabilities, to providing leadership development, healing and therapy, there are many ways that we utilize horses for our well-being, our growth and our enjoyment. As a deeper perspective, I also believe horses to be our partners in the evolution of humanity and our own self-awareness. When we are around horses, we are forced, due to simply being present with a large animal, to be more present within ourselves, which in turn leads to us being open to seeing where we can be more self-aware. Many of us know this, and we take advantage of what occurs when we are around horses. We see nothing wrong with shipping horses off, often in horrible conditions, to be slaughtered for meat. This is an animal that has been proven to be intelligent, both intellectually and emotionally — a sentient being, aware of every condition they experience. We ask them to serve us, to take us on their backs, to bring us to war and we breed them and ask them to perform and run for our benefit. And then we send them to slaughter. From Kentucky Derby winners, to a child's best friend, to a noble service animal, to a well-worn working horse who gave his heart out in the fields — they deserve better. I encourage Canadians to question and be mindful of what might happen to your horse, or your friend's horse, after they are done in the ring, or being "useful" in society. The drive behind the spaces I hold with my horses is based in knowing that if I can give people an experience with a horse that results in them experiencing them as sentient beings, while witnessing their intelligence, then they might walk away with a greater respect and appreciation for what they contribute and a different way of treating and being in relationship with them. A couple of years ago, on the first facility that I leased, I used to run events where I would invite people out, for a nominal fee, to experience the wisdom of the horses. A Chinese gentleman came to one of the events, a culture that sometimes eats horse meat and does not always share the same value around animals that we do. I can't remember what drew him to the experience but I remember what he left with. As he was leaving the farm, he said to me, "I will never look at a horse the same way." It is not realistic to hope that in my lifetime I will see the end of slaughter, but at least I can do my part by exposing people to a different way and experiencing a relationship with these amazing animals. I believe awareness and education can go a long way and many are not aware of what happens to horses when they are shipped outside of North America for meat, because the demand for horse meat does not lie here. I encourage Canadians to question and be mindful of what might happen to your horse, or your friend's horse, after they are done in the ring or being "useful" in society. Our own herd of 18 rescues were horses looking for a retirement home and second purpose because they couldn't be ridden in a saddle anymore. The majority of our horses, at aged 18 and up, are showcasing just how useful horses can be — beyond their time in the saddle — teaching us about ourselves and how to overcome our own perceived limitations. This is not just about the end of slaughter, this is about a greater awakening for us to be responsible, to be ethical, and to be conscious of how we are treating these animals, ourselves and our planet. Horses: Aren&#039;t They Just Amazing?